Spectator Dashboard 2 provides real-time information and statistics while you spectate a game or watch a recorded game. While watching a game, type "!dash" or "!dashboard" into the chat, and the dashboard webpage will open in your default browser. You can then bookmark the page and open it whenever you want. It will always show the current game. Cycle the in-game overlays between overview/economy/military/transactions with F4. Cycle the in-game overlay between all/tables/off with F11. Move overlays by holding Shift and using arrow keys. Repeat for next overlay. Change font size by holding Shift and pressing + or -. Research Timeline: Shows progress of current researches and history of past researches. Includes start and finish times, taking into account civilization bonuses. Canceled researches will be crossed out. If a building is destroyed while researching, this won't be detected. Map: Overlays animated heatmap onto map that shows locations of recent player activity. Marks location of gold, stone, fish, berries, and relics. Marks player start position, including nomad starts based on first TC. Chat: Allchat and teamchat. Enemy team chat also available if spectating in real-time. Population: Total population, military, and economic. APM: Plots relative APM over time. It shows the instantaneous APM (total actions taken in the prior 60 seconds). The following actions are counted: Research, Attack, Move, Flare, Buy, Sell, Formation, and Build. Other actions are not attributable to players, and it does not measure every key press or click. 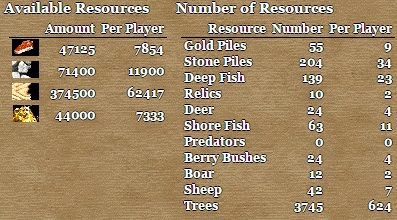 Starting resources: Lists total and per-player resources available on the map, broken down by resource type and source. Villager allocation: How many villagers are working on each resource. Relics: Number of relics controlled, and total gold earned. Trade carts: Number of trade carts, and total gold earned. Market: Gold purchased at market. Tribute: Gold gained via tribute. Kills: Kills/Losses between each player. Razes: Razes/Losses between each player. Efficiency: These numbers are best used as relative comparisons. Villager idle time: Total seconds of villager idle time. Gather efficiency: Actual resources gathered divided by optimal amount (optimal is number of villager work seconds multiplied by resource gather rate). Trade cart efficiency: Actual gold obtained divided by optimal amount (optimal is markets at maximum distance with no obstacles). Ratios: Presented in decimal format, larger being better. Damage is the value of units and buildings lost. Spending is the total amount of resources spent on buildings, units, and research. K/D: Total kills divided by total deaths. Control: Greater than 1: primarily attacking. Less than 1: primarily defending. log scale. ROI: Return on investment: Damage inflicted divided by spending. exponential scale. Damage: Damage inflicted divided by damage sustained. Safety: Spending divided by damage sustained. log scale. By category: Military, economy, technology, & society. Training units: Number of units currently training. Queued units: Number of units queued awaiting training. 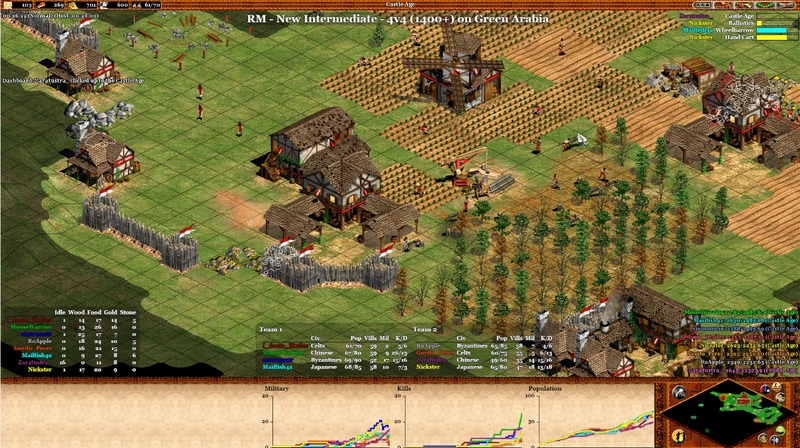 In-game overlay: Selected information is available in-game. The researches overlay is always visible if researches are in progress. 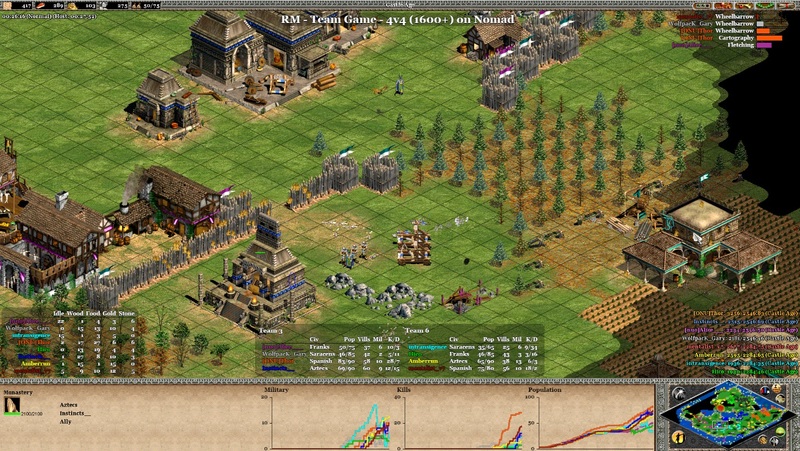 You may toggle between the General, Military, and Economy overlays via the mini-map mode buttons or hotkey. You can toggle both the table and research displays on and off entirely. Having the dashboard webpage open is not a requirement for using the in-game overlays, but you can use both if you wish. 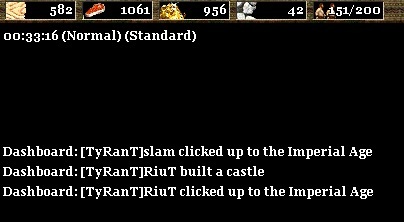 Alerts: Notifications about key events: clicking up, reaching an age, collecting a relic, building a castle, losing a castle, first dock, getting housed, and starting trade. Appear in both dashboard and in-game chat. Customizable Dashboard: Select any chart or table and move it to the Dashboard. Once on the Dashboard, it can be moved and resized, so you can view all data you're interested in at once. OBS overlay support: Any chart or table can be used in an OBS overlay, with either a light or dark theme. Thanks to Bari, biegleux, Iam_Fiction, and Idle Beaver for file format documentation. Post a complete problem description. If you experience a problem with a specific game, link to the recorded game.